On the night of March 24, 1989, the Exxon Valdez oil tanker ran aground on Bligh Reef in the pristine waters of Alaska's Prince William Sound. The first of what would turn out to be 10.8 million gal. of oil began to spew forth into the cold waters. It would eventually spread almost 500 miles from the original crash site and stain thousands of miles of coastline. Hundreds of thousands of birds, fish, seals, otters and other animals would perish as a result, despite the mobilization of more than 11,000 people and 1,000 boats as part of the cleanup. While the Exxon Valdez oil leak is considered to be the largest man-made environmental disaster in U.S. history, the Gulf of Mexico spill may eventually surpass it in severity. 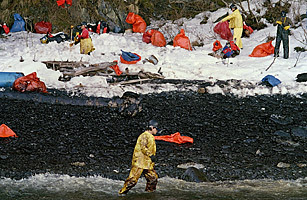 See TIME's brief history of the Exxon Valdez disaster.